Contest: Ultimate Modern Man Lifestyle Giveaway! Ultimate Modern Man Lifestyle Giveaway! 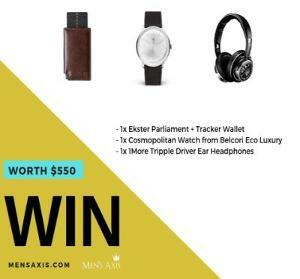 Prize: Enter this #giveaway to #win the Ultimate Modern Man Lifestyle Giveaway valued at $550 from Mensaxis.com! What you must do to enter: Follow the ways to enter for the chance to win. Statistics: This contest was opened by 22 and entered by 2 ContestChest.com members. 9% of those who opened the contest, entered it.